Sweet potato has become a regular at home these days for us. I initially started buying it to make baby food for Ishaan. Then soon realized his lack of interest in eating it. With very little time on hand, I can just make one-two dishes each day. So I make something all of us (including Ishaan) can eat. If you like sweetish spicy dishes, this is for you. I don’t make it very spicy. I mix this and rice, mash it up very well with a spoon and feed him. He loves it. (No, don’t worry, I am not turning it into a baby food blog. But since I have a couple of friends who are at the same stage in life as me, struggling to come up with some dishes for their babies, I have decided to post my experiences here). This is my personal favorite dish too. Sweet potato gives a nice sweet taste to it. Goes really well with plain dal and rice or with rotis. 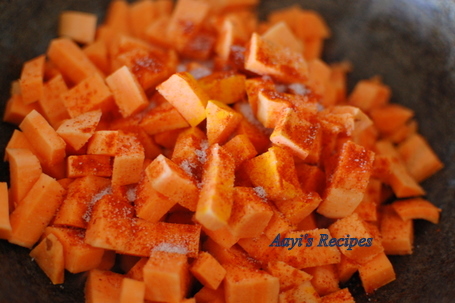 You can also make it with a mixture of normal potatoes and sweet potatoes. Heat oil and add mustard seeds. When they start popping, add curry leaves, asafoetida. 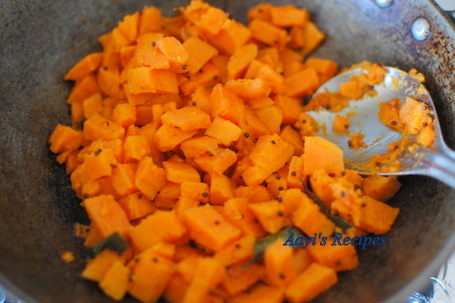 Add sweet potatoes, chilli powder (reduce the amount if your chilli powder is too hot), salt. Mix well. Cover and cook on a medium heat. We love it too. I replace chilli pd with green chilli and add grated coconut. This is a good for Ishaan’s taste buds. Long time no see! Lovely as usual! Enjoy your time with Ishan they grow up so fast. Thanks for all the delicios receipes. A humbe request to continue posting toddlers receipe. I have a 2 year old baby, very fussy about food & i am a working mom. Great idea and must turn out well – with the spicy and a tinge of sweetness. and yes, adding the chilli powder gives it the classic Konkani touch (TaLÄsaN)! Love it! You should add this to a new Category “EACMT” : Even Arun Can Make This! Hehe. I love that category name :). So you can make this when we visit you, right? I think this is called Yam in US, different from sweet potato (which is not so orange in color). Please clarify. Thanks for recipe, looks yummy. We love sweet potatoes at my house. I’m with Aruna,in that I added a little coconut to it. Is good yeah. Hi Shilpa, I am regular follower of ur blog and eventhough i am not a konkani, i am trying ur dishes in my home and it became a great hit. I am a mother of 8 month old baby and my US Doctor strictly recommends me not to use spices liek chilly powder, salt , oil to the baby below 1 year. So we are giving him boilde vegetables, potatoes etc without spices and rice. 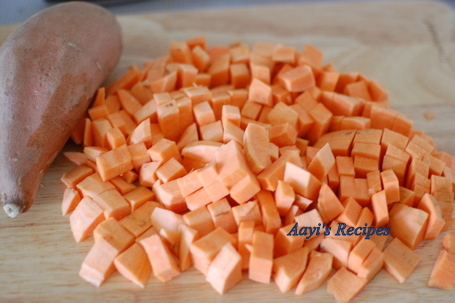 I love sweet potatoes and this recipe sounds delicious. I like the suggestion of adding coconut. 🙂 creative recipe. I tried this yesterday. came out really well. Thanks!! I had this with egg fried rice, obviously the talasani was dominating because of its sweet n spicy taste 🙂 but I must admit, it was a nice,unexpected combinaion. good one—though i make it a little differently ! Quick and delicious recipe.. looks absolutely perfect.. Lovely click !! 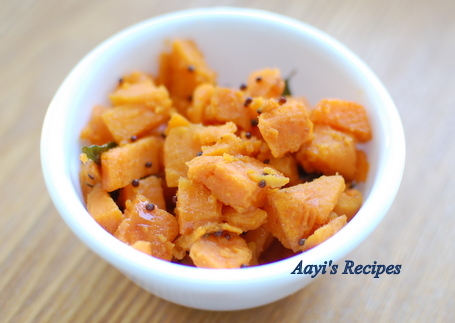 hey thanks for posting this.. i love your recipes anyways, but this one is great as i have a 2 year old and i also try to cook dishes that all of us can eat together.. my daugther loves sweet potato so this will be a hit at home!